What kind of horrible, dream-killer would say something like this to a child? Please allow me to explain. As a boy, I had the same dream as many American boys. I wanted to be a professional basketball player. 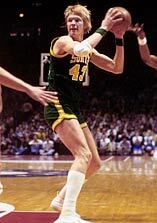 The Sonics won the championship when I was in 2nd grade and Jack Sikma was my favorite player. This really started my interest in basketball. Even though I had some success as a basketball player growing up, I never had the size, strength and speed required to play in the NBA. No amount of my parents telling me I was wonderful was going to change that. When God created me He gave me other gifts and abilities that aligned perfectly with his will for my life. Sports is an easy arena in which to face reality because of the tangible results. There are game scores, teams chosen, and lots of measurable statistics of athletic ability. The inches on one’s vertical leap, bench press weight and reps, and 40-yard time are indisputable facts. It’s more complicated in everyday life to figure out what one is good at and…where one isn’t gifted. I believe it creates a lot of stress and pressure on a child, teenager or even an adult when they feel it is up to them alone to determine the course of their life. God doesn’t expect us to bear this burden alone. He created us and has a wonderful plan for each of our lives (Jeremiah 29:11). As parents we need to help our children discover and develop those God-given gifts. Please don’t teach your kids they can be anything they want for this won’t lead to true happiness in this life. Instead teach them to discover what God has created them to be. This will keep their eyes on their relationship with God instead of comparing themselves with those around them. When people measure themselves against others, they will never measure up. But when they seek to meet God’s will in their lives, they can rest in the assurance that God’s gifts are sufficient. This entry was posted in Biblical Worldview, Family. Bookmark the permalink. Post a comment or leave a trackback: Trackback URL.